It went on sale Oct 22 2009 I bought it on the 23rd. 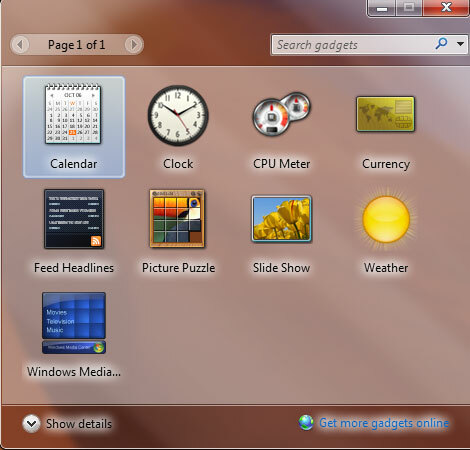 I have installed it and I like it and it is worth moving from Vista and XP. If you are Upgrading from Vista you should have no problems as long as you have installed all the updates and patches for Vista. I never do an upgrade I do a clean install, you have to save all your data and then install the Programs that you were using to 7 and then put the data from the programs back where they came from on XP to 7. With XP when you use the Upgrade version you have to do a clean install anyways, as I outline below. 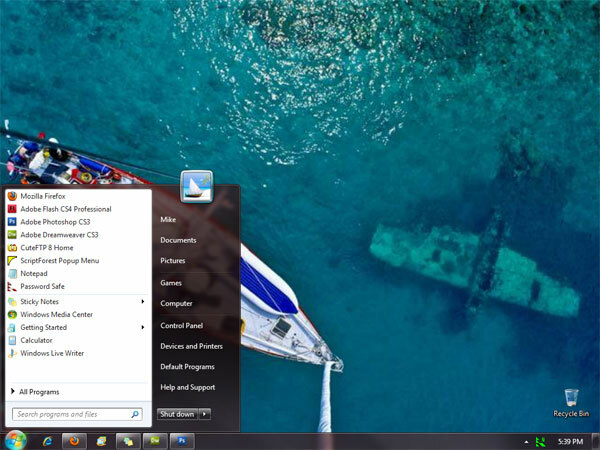 With Vista you can Upgrade or do a clean install when you use the Upgrade version. With a Retail version you just do a clean install, but if you ever have to reinstall, you do not need XP on the drive to reinstall it, like you would with the Upgrade versions and if the computer dies you can install the Retail Version on the new computer. At MS TechNet they have an Upgrading guide that you should take a look at before you decide to move to Windows 7 located at Windows 7 Upgrade and Migration. Gives instructions on steps to take to upgrade or migrate your files and settings to 7 from Vista or XP. There is also a good article about moving to 7 at a Blog on Techrepublic 10 things you should know if you are moving from XP to Windows 7. I bought the Family Upgrade for 3 computers for $149.00 at Walmart, a good deal. The bad is I usually do not do the Upgrade thing, BUT, a Retail Version is $200.00 per computer. So I am going do the Upgrade because I have to do a clean install anyways and it is cheaper. You need to check out the Windows 7 site for all the options, XP cannot be Upgraded, it has to be a clean install, which means I will have to reformat each computer and then install 7, now that is for my XP Home and Pro versions. I would download the compatibility checker from HERE and run it before you buy 7, I did to make sure, it will tell you what version of 7 to use and if your computer can even run 7. Fun, fun, well I decided to put 7 on my gaming machine, never play games anymore anyway's, lol. It is faster and better then the one I am using right now. It has XP pro OEM on a 37 gig harddrive which I am going to leave in the box unconnected, if I want to play the games on that drive I will just unhook the 7 drive and hook up the XP drive, I have a 160 gig harddrive with Windows XP Home on it that I am going to use for 7. The fun begins, I will need to install all my programs I use like Flash, Photoshop, dreamweaver, malwarebytes, cuteftp, on and on to the Windows 7 machine, this is going to be fun. Before I install 7 I need to backup all my files that are on the XP Home drive, I made an External Hard Drive using an old IDE 120 gig hard drive and an enclosure kit I bought for $20.00, How to here. The External Hard Drive I made uses a USB connection, you just copy and paste the files from XP to the External Drive. Also the option to right click on a programs shortcut and choose in what mode you want to run a program like in XP is still in 7, found that out after it was installed. So if you have software that ran in XP you can run it in XP compatibility mode like we did in XP if it has problems running on 7. It took me about an hour to transfer all my data to the external drive, favorites, My Documents folder, wallpaper, any saved data like OpenOffice.org files. Everything is backed up and I am ready to install 7. Ok my next problem is Hardware compatibility: Once Windows 7 was installed it found a driver for my Radeon X1650 Graphics card and for my Soundblaster Live sound card. I had no internet connection, it could not find drivers for my Linksys NC100TX network card. I had to take that one out because Linksys has not even made drivers for Vista for these cards. I took a Realtech out of another computer and 7 install drivers and I got online. When I did the Windows Updates it found and installed updated drivers for the Soundblaster, Realtech and the Mouse. I was able to find an updated driver for the Radeon card at another site. Software, so far I believe all my Adobe programs should work fine with 7. I would imagine AVG has a new version for 7 and Malwarebytes should be fine. Regcleaner will probably bite the dust as it is not maintained anymore. My CuteFTP software I am sure will work, it may need an update once installed. Scriptforest the software I use for my Java menus, is regularly updated so I am hoping it works on 7. Some say that if the software worked on Vista it will work on Windows 7. My problem is I never upgraded to Vista, did not like it, just like I never updated to Me, lol. Being that you can not do an Upgrade from XP to 7 maintaining all your files and settings, which I would never do anyways, with XP it has to be a clean install of 7, that means that the core coding of 7 is way different then XPs. As far as your regular software like Firefox, Incredimail, Quicktime, Adobe Reader all those will work for sure. 7 does not come with Outlook Express or any email client. You could use Windows Live Mail, Incredimail, Firefoxes Thunderbird or an online email like Hotmail, Yahoo, Gmail. With Windows Live Mail I believe you can connect to any of the online emails and use pop3 acct's. I am going to try Thunderbird first and if I do not like it probably try Incredimail. I am using a 160 gig drive with XP Home installed, going to do a Custom Install, have everything backed up and ready for the installation of 7. Setup is starting, Accept License, Upgrade and Custom options choosing Custom, found the drive, the option to delete the partitions and after that choosing to reformat the drive, that is done now it is installing all the files going through setup, video, etc, name computer screen, next Password easy one for now, product key, it took the Key, installed in around 20 minutes XP takes around 40 minutes, woot. Ok I am booted into 7, had no drivers for network card Linksys NC100TX. I used a Realtek RTL8139/810x Family Fast Ethernet NIC Network card out of another computer, the Realtek worked in 7. Everything works so far, as far as hardware is concerned, surprised the graphics adapter worked and Aero works, Aero is an enhancement to the Desktop, rotates pictures has a Vista look to it. 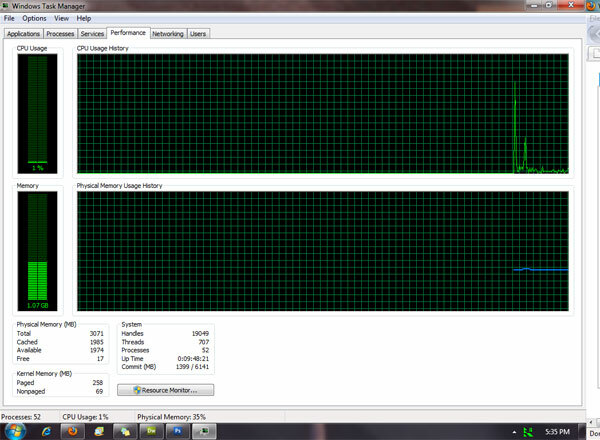 So far it is using 848 megs of RAM and is running 49 Services, will be turning some of those to manual I would think. The install was much faster then XP and it seems to run as fast as my XP Pro did. I set the Control Panel view to Small Icons from the Category view. Downloaded and installed AVG free, works perfectly. Now going to download Password Safe and import all my accts, Password Safe worked. Downloaded Malwarebytes, ok. Well the list would go on and on so if any do not work I will post those only. Need to figure out how to automatically login in, nothing in the User Accts to do that. A bunch of Windows 7 updates, including some hardware updates, hope they work. A Soundblast Live 24-bit update cool! IntelliPoint wireless mouse driver update and the right one. I lost my Network connection after I shut down and restarted, TIP do not use Linksys Network Cards, I had to go to the Control Panel, then open the Network Adapter, go to the Advanced Tab, I set, Link Down Power Saving to-Disable and Link Support Speed/Duplex Mode to, 100Mps/Full Duplex and it worked, it was on Auto Negotiate. I recently replaced the Realtech with a new D-Link Network card, loaded the drivers installed the card and it works perfectly in 7. The Auto Login is as follows, go to Run and type in control userpasswords2 hit the Enter Key, the User Accounts screen will popup a hidden user control in 7, next select the User and highlight the acct and then uncheck the User must enter a user name..., next click the Apply button a panel will popup to set your password, imput the password you are using to Login to 7 then click the OK button, restart and test it out. You should also make a Password Reset disk in case you forget your Admin password, go to the Control Panel, then open Parental Controls, click User Accounts located in the bottom left corner, then click the Create a password reset disk, a Wizard will pop up to walk you through the process, I put mine on a USB drive, you can also put it on a floppy disk if your computer supports them. Parental Controls, XP did not have all these capabilities and if you have children using the computer it gives many ways to monitor and control how long they can use the computer, when, rate games they play and many others. This is located in the Control Panel, open it and click on the Why do I need an Account for this? and How do I install additional controls? for information about this feature. I installed Firefox and you will need to get all the plugins for it and install them, Flash player, Shockwave player, Java, Adobe Reader, Quicktime if you use it. Just go to the Firefox page and go to Plugins page. I also had to install the Flash Player plugin for Internet Explorer and Adobe Reader. The Shockwave Player said not available for firefox, you will have to do a Manual install of the Shockwave Player to get the plugin to work download it here Shockwave Player I did this and it now works in IE and Firefox. Next is an email client, no Outlook so I guess I will not be able to move my saved emails over to this machine. Well my choices are Thunderbird, Incredimail and Windows Live mail. My wife uses Incredimail and really likes it, because it has all the fancy stuff, I like a plain old simple email client. Going to give Thunderbird a try, looks and feels a lot like Outlook. Thunderbird worked, had to download it unto my regular XP machine and imported all the info from Outlook, then copied that Profile to my 7 thunderbird profile folder. After that I had to create a new profile in Thunderbird and used that folder for the new profile, seems like everything is there, had to reenter all the passwords for each email acct and saved them to Thunderbirds Password Manager. OK, enough of Thunderbird, going to Incredimail, lol, Hmm Incredimail is gone to, no like, ended up using Windows Live Mail, was better then the rest and had some fun stuff in it to. I was also able to import all my contacts and email folders from Outlook to Live. Ok started Sunday around 2:00 pm and finally done Monday night at 12:00 pm. It took that long to install all my software to 7 from the XP hard drive. Now do I keep my other XP or upgrade it to 7, will need a new Network card they are cheap, not sure if the graphics card will work, have to do the compatibility check. I guess I will upgrade my wife's Emachine first after I put in a graphics card, 1 gig of ram, she only has a 1 gig and that machine will only hold 2 gigs and a new power supply, before the factory one fry's the Mobo and Emachines are notorious for bad power supplies. I usually build my own but it was brand new with XP and for $298.00, I can not build one for that amount of money. Wow moving to a new OS can be a pain, but ya gotta keep up with technology. Actually Windows 7 is built more for the newer computers, mine is a 32 bit system and the new ones are 64 bit, that is something to check when you go to 7, with the 3 pack deal you get a 64 bit install DVD and a 32 bit DVD make sure you use the correct one. Well where is all the stuff we use to keep the puter running fast. Scandisks and Defragmenter are in the same place as XP, Start then Computer (Xp is My Computer), right click the C drive and choose Properties. 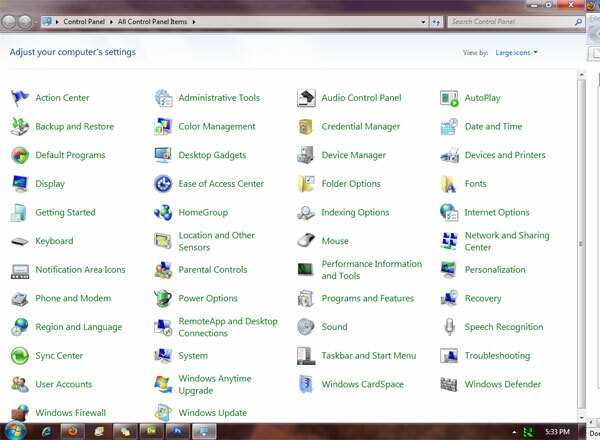 Task Manager is in the same place, right click on the Task Bar and choose Task Manager. Control Panel is still the Control Panel a few more Icons/Programs in it. In the top right corner is View by: Category, there is a drop down box there you can choose Small or Large Icon view, if you have trouble seeing, like me, use the Larger Icons, that is what I am using. Device Manager is still the Device Manager, everything is pretty much the same as XP only with a few extra programs like, Personalization, Desktop Gadgets, Windows Defender and a few others. Actually 7 looks and is a lot like Vista but toned down a little to make it faster. Right now I have Dreamweaver, Firefox, Control Panel and the Task Manager open and I am using 1.20 GB of Ram, I have 3 GB of ram installed. So if you install 7 like Vista have at least 2 or more GB of RAM. I was able to get the Memory Usage down to around 809 MB by turn some Services to Manual I followed these suggestions at Tweaking with Vishal. Just so you know Internet Explorer the 64 Bit version can not use the Adobe Flash Player yet, I do not use IE I use Firefox and there is no problem playing Flash Games with Firefox. Also if you have a website and use htaccess to Password protect your folders, hmm, IE does not work for that, Firefox does and I download Safari tp replace IE when I need two browser, it also works. MS you are releasing these things before everyone is caught up and ready. My Documents has two folders, one is your private folder and one is a Public folder that other accts on the computer can access. I ran Defragmenter and it no longer has the graphical interface just runs and tells you what percent is defragmented. Ran Scandisk and that works the same. The neat stuff is the Gadgets, you can can get these for XP to but nice that they are included, stuff like a Calendar, fancy clock, weather feed, Headlines Feed, currency and a couple others. 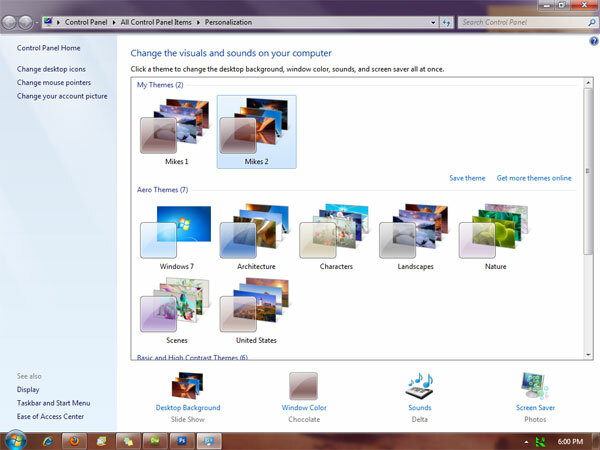 You can Personalize your Desktop with rotating wallpaper, colors, sounds, change your Icons, mouse pointers all on one screen. A neat thing you can do with 7 is if you have 2 windows open and you would like one on one half of the screen and the other one on the other half of the screen, just drag one of the windows past the left edge of the screen and it will snap to half of the desktop, then drag the other window to the right side of the desktop off the screen and it will snap that window to fill the other half of the screen. I have 2 monitors so with mine I can only have the one on the left monitor snap to the left side of the desktop and on the right monitor it will snap to the right side of that monitor. In Start-Accessories there is a tool called the Snipping Tool, if you want to copy a picture or webpage or just part of your desktop open the Snipping Tool, drag the tool over the area you want to copy it will ask you what you want to save it as and where. You can make windows open and close faster by going to the Control Panel, then System, then on the left side open Advanced system settings, System Properties will pop up, click the Settings button under Performance, uncheck Animate windows when minimizing and maximizing and click Apply. You will notice that open windows close much faster and open faster now. If you like the fade effect just recheck the box and click Apply. Try it out and see if you notice a difference. Pictures shown as Thumbnails not Icons: I recently help a lady with her Laptop running Vista and she wanted her pictures to show as thumbnails instead of Icons. If you go to Documents, then go to Organize, then choose Folder and Search options, then open the View tab, uncheck the first line that reads Always show icons, never thumbnails. Click Apply and OK, your pictures should now be displayed as thumbnails. This works in Vista and Windows 7. 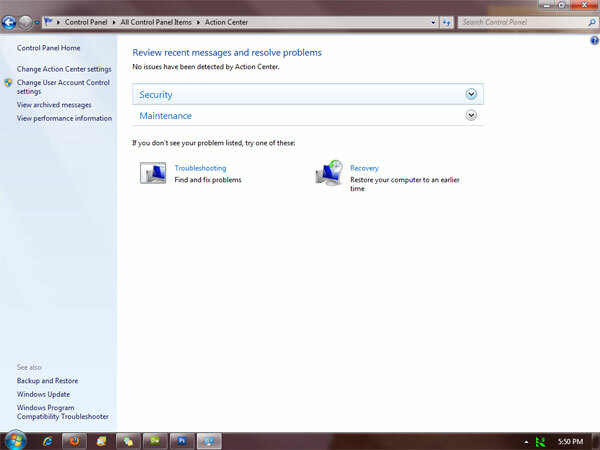 We all know msconfig and 7 has it by typing it into Run, but a better way to speed up 7 is to go to the Control Panel, then open Troubleshooting, under System and Security click the Check for performance issues. A window will pop up, click Next, it will go through a few steps and let you choose what you want to run at Startup, I also ran the Explore options as Administrator that is where I was able to choose what to turn off for Startup Programs. Another way is to go to the Control Panel, then open the Administrative Tools, then open System Configuration, then go to the Startup tab, just a better way to access msconfig. If you go to the Tools tab here you can turn off some things if you want. I turned off the UAC control, the popup window that ask you if it is OK to do something and you have to click the Continue button. If you click Change UAC Settings and then click Launch there is a slider bar you can use to set it, to Always down to Never. It is good to leave this at the default, if a bad program tries to installs itself on your computer this will alert you and ask if it is ok to let this Program run, you can deny it from installing. Then hunt the little bugger down and remove it. 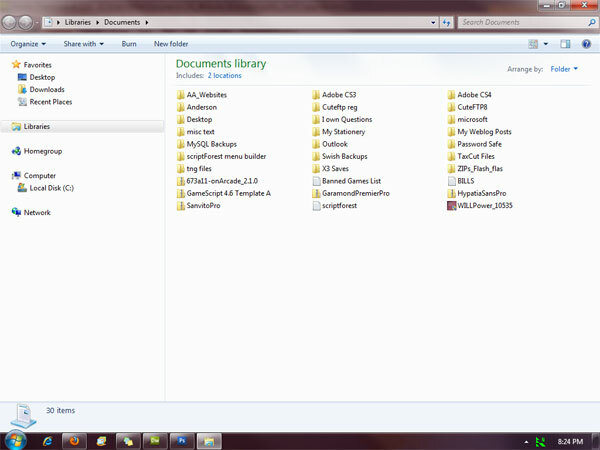 Then go to your downloads folder and right click on the Autoruns zip and choose Extract All. The picture shown below should open after agreeing to the Terms and clicking OK to allow it to run, the Logon tab is where all the Startup Programs are listed, there is a lot of info in there, lol. Go back to the page where you downloaded it and read up on how to use it. I have PhotoShop, Dreamweaver, Task Manager, Firefox and Sticky Notes open and it is using 1.07 GB of RAM/Memory. I set some Services to Manual and shut down some Startup Programs and it is now at 849 MB. If there are actions that need to be addressed like updates this will notify you on the TaskBar. The Backup and Restore, Windows Update, User Account Control settings and Performance information links are here plus other. This is neat you can set your wallpaper to display different photos, a slide show, but it is nice to have it including as a feature of 7. This is neat you can put gadgets on your Desktop, I use the Calendar. This like My Computer and Windows Explorer combined, the panel on the left is used in Documents (My Documents XP). This like My Documents and Windows Explorer combined, there is also a Users Name link in the Start Menu to this page also, mine is Mike. 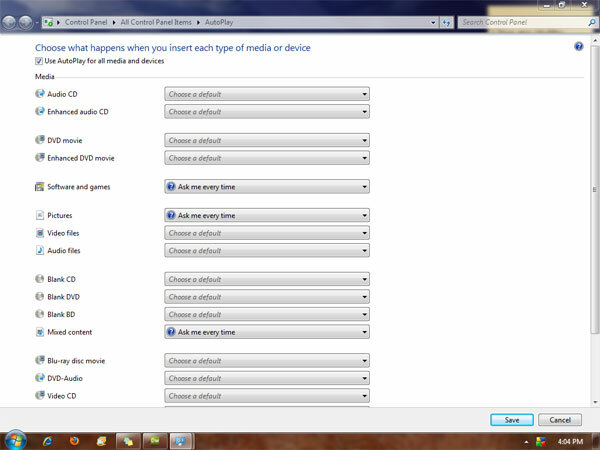 This is a nice feature, it is the Control Panel, you can choose what program you want to use to open or play media. I used Windows Media Player to open and play any videos, check it out. I remember having to go to Folder Options to do this in 98, lol. 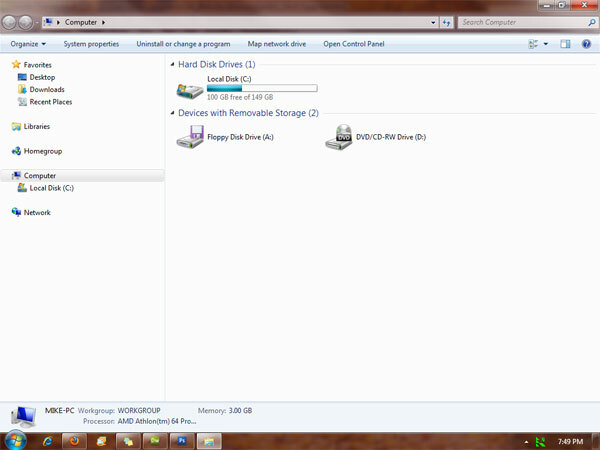 I made myself my own External Hard Drive, How-To-Here, I used that to make a backup with Windows 7. 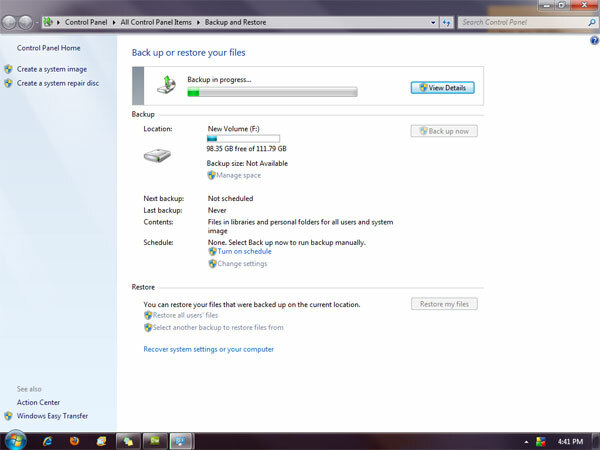 It took about 1 1/2 hours and 48.9 GB of space, it backed up my files and made a Restore Image for Windows 7. It is located in the Control Panel, very easy to use and if you have a big drive or a slave drive you can schedule regular backups. I turned the scheduling off as I do not leave the external drive on all the time, will backup every couple weeks. Another very cool feature is Sticky Notes you can put on your Desktop I put all my appts on a Sticky Note. Another feature is pinning Icons to the Task Bar as well as the Start Menu, those Icons next the Start button on the lower left side of the Desktop in the picture above.